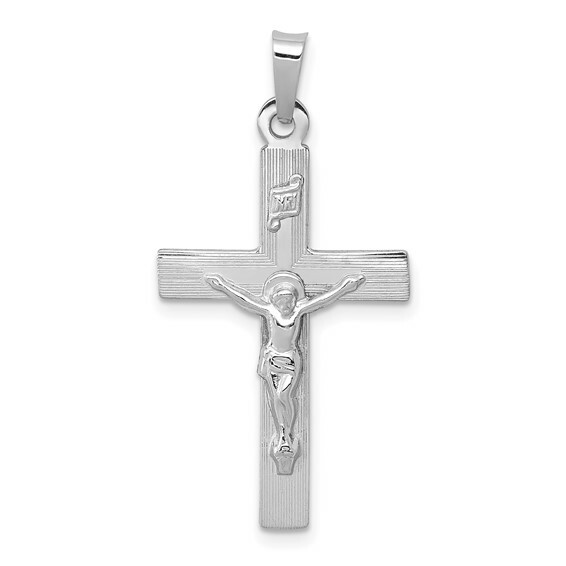 14k white gold INRI crucifix pendant has fine lines. Item measures 5/8 inch wide by 1 inch tall without loop and bail. INRI means Iesus Nazarenus Rex Iudaeorem. Nailed to the top of the Cross, this Latin inscription given by Pilate translates Jesus of Nazareth, King of the Jews. Weight: 1.7 grams. Made in USA. Simple classic look, for everyday wear. Not bulky nor uncomfortable. Great piece for the price.